Welcome to BISH Summer where our world-class, personalized learning approach will inspire your child to achieve more, be curious, and to be ambitious. Whether you're playing sports, creating a theater performance, or investigating a solution to a Lego engineer challenge, every experience is meaningful. 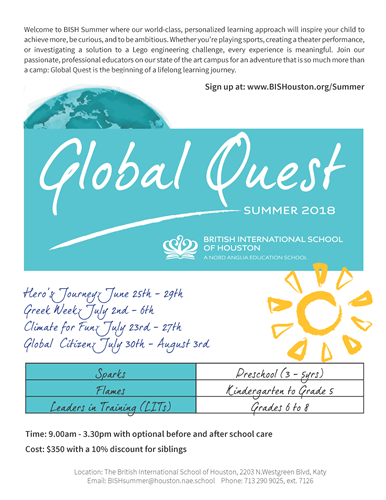 Join our passionate, professional educators on our state of the art campus for an adventure that is so much more than a camp: Global Quest is the beginning of a lifelong learning journey. Optional before & after care is available for an added cost.